ST. LOUIS (AP) — The worst drought in the U.S. in decades may be leveling off or even be easing ever so slightly in some lucky locales, federal weather forecasters announced Thursday in a report of little comfort for farmers and ranchers who already have begun tallying this year's losses. While the latest forecast from the National Oceanic and Atmospheric Administration's Climate Prediction Center calls for the drought to linger in the nation's breadbasket and parts of some mountain states at least through November, it provided a silver lining with the news that conditions aren't expected to get worse. Conditions may even improve in the Southwest and in a band sweeping from South Dakota through a section of Iowa and east to southern Indiana, then south to Texas. Some areas have seen rain and cooler temperatures in recent weeks, although one forecaster cautioned he doesn't expect enough extra rain to end the drought. Ed O'Lenic, a seasonal forecaster at the center, said his September-through-November outlook "is taking away the dry, but not necessarily making it wet." 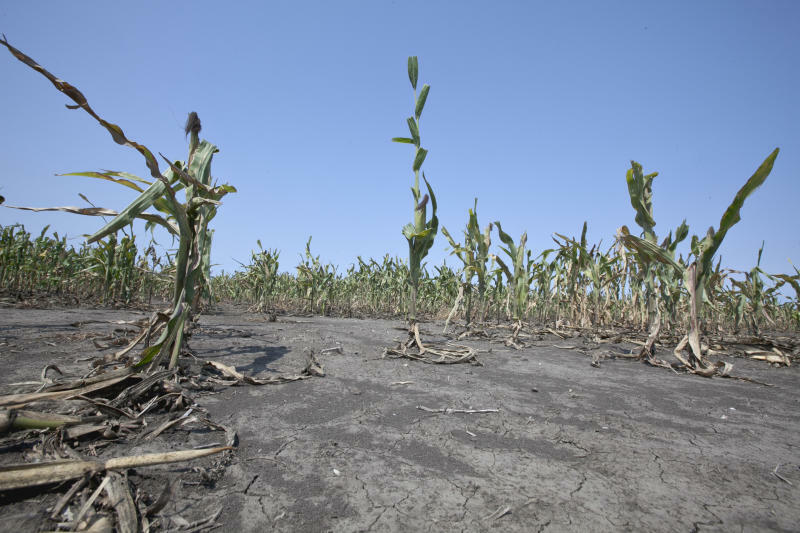 Illinois state climatologist Jim Angel, a drought expert, said he would describe the drought as "leveling off," rather than easing. The rain and break in 100-degree temperatures comes too late for most farmers and ranchers, who already have seen crops wither and pastures dry up. Corn farmers in some areas cut their fields weeks ago, giving the year up as a loss. Many ranchers have sold livestock because they had no grass for grazing or money to buy feed. Even farmers who still have crops in the field aren't likely to benefit from rain this late in the growing season. In some areas, farmers who planted corn early in the unusually warm spring have started harvesting. "The impact in a lot of places has been done for this year, and any easing will just help things out a little next year," said Mike Brewer, a National Climatic Data Center scientist who put together the latest weekly U.S. Drought Monitor map released by the National Drought Mitigation Center at the University of Nebraska in Lincoln. Brewer's update showed the drought worsening in Kansas and Nebraska even as it eased in other key farming states. Overall, the amount of the continental U.S. mired in drought remained about the same at 61.8 percent as of Tuesday. The portion enduring extreme or exceptional drought — the two worst classifications — also remained virtually unchanged at 24.14 percent. 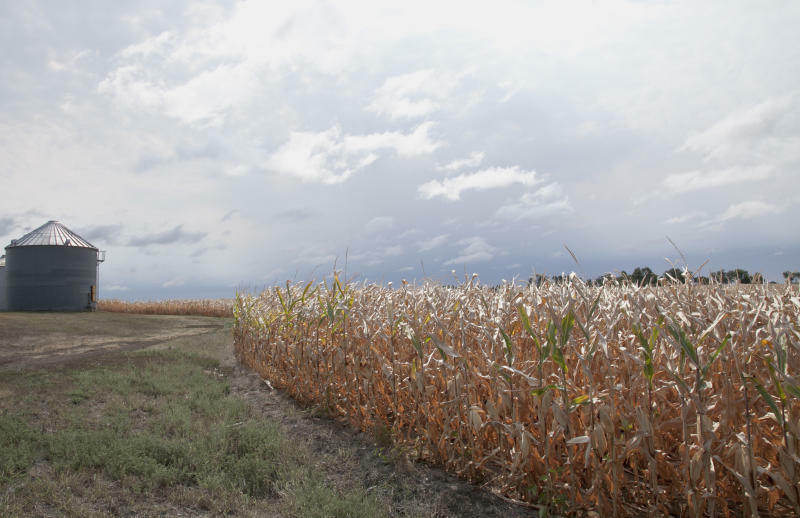 In Iowa, the nation's leader in corn production, there was good news, with the amount of land in the two worst categories of drought dropping 7 percentage points in the past week to 62.05 percent, thanks to recent storms. Conditions also got slightly better in Illinois, another key supplier of corn and soybeans, with the amount of land in the two worst drought categories slipping from 81.18 percent to 79.54 percent. But in Nebraska, the amount of land in exceptional drought spiked by 19 percentage points to 22.5 percent, and in Kansas, it jumped from 38.6 percent to 63.3 percent. The deepening drought continues to strain Ken Grecian, a Kansas rancher who has sold off one-fourth of his 320-cow herd as heat and drought burned up his pastures. He has spent the summer scrambling to find grazing and haul water to his cattle. Just last Friday, he peddled 37 more cows at a sale barn and took all his calves to a feedlot to take the stress off his remaining animals. Cows that were nursing had started to lose body fat, and their ribs and backbone were showing. Grecian, 62, who lives near Hays, said he feels fortunate he has been able to move the cows he has left to 1,000 acres of conservation land opened for grazing by the federal government. "We will find a way to keep these cows through the winter," he said. "I guess the sad reality is we won't know until spring whether we are out of this situation. We have to have precipitation — in the form of snow and spring and fall rains — to put enough moisture back in the soil to grow pastureland." 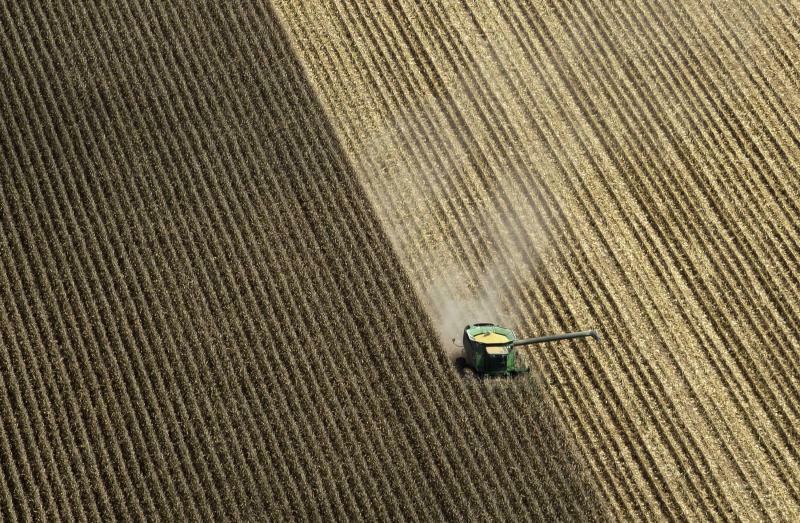 The U.S. Agriculture Department twice has slashed its forecast for this year's corn and soybean output because of the drought and now expects the nation to produce 10.8 billion bushels of corn, the least since 2006. If that estimate holds, the federal government says it will be enough to meet the world's needs and avoid shortages, but experts say food prices will almost certainly climb as corn is an ingredient in many products. This January through July has been by far the hottest start of the year in U.S. weather records dating to 1895, and there's about a two-out-of-three chance that 2012 will set a new record for the U.S.'s warmest year, NOAA climate scientist Jake Crouch said. NOAA records say that 1998 was the warmest year on record in the United States. Associated Press science writer Seth Borenstein in Washington and AP reporter Roxana Hegeman in Wichita, Kan., contributed to this report.